It has been a busy week, and there has been no time for blogging. I miss it now if I haven’t found the time for it. But the weekend is coming up and I am hoping there will be lots of time for knitting and blogging. I have started a new knitting project which I am very excited about: a sock yarn blanket. I was inspired by Martine from the iMake blog, who has been working on a sock yarn blanket for a while now. The idea is to use up all the left over sock yarns from other knitting projects to knit a blanket consisting of lots of tiny (approx 5 x 5cm) mitred squares. 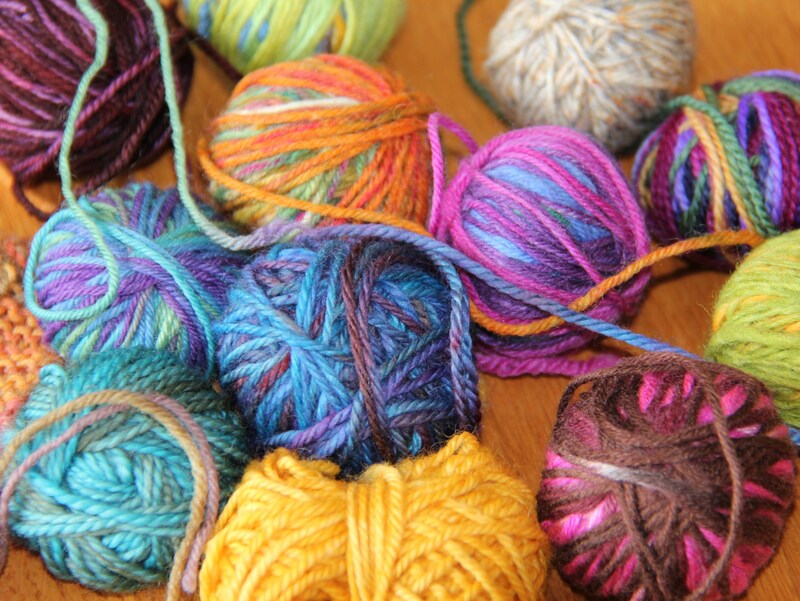 As you need lots of different colours in tiny quantities, the best way to get hold of different colours is to swap yarn with other knitters. So although everyone works on their own blanket, it’s still a lovely communal activity in its way. This project suits my current knitting mood perfectly, as it involves lots of random colours and very simple knitting. 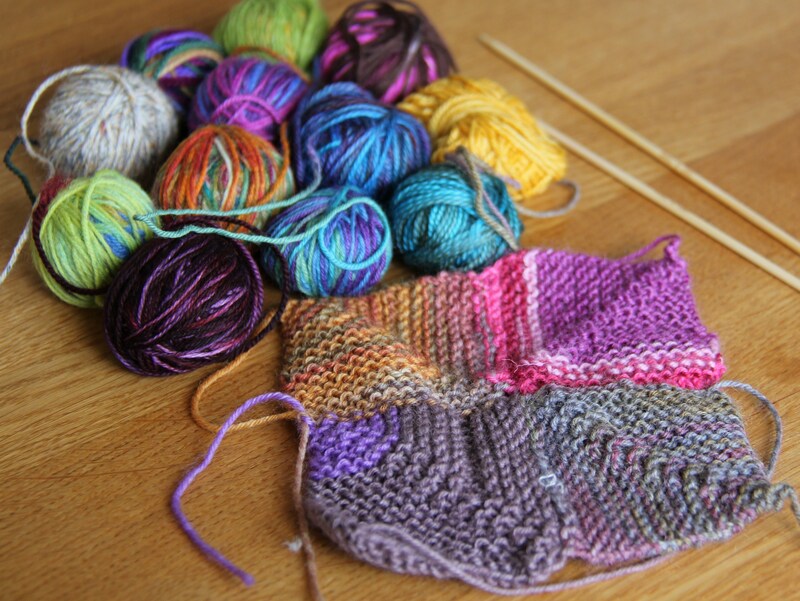 No planning required, just knitting and enjoying the vibrant colours. As I haven’t worked with sock yarn of this weight before (all the socks I’ve knitted in the past have been made with much thicker yarn), I was “forced” to buy a couple of balls of sock yarn to get started. But as four colours doesn’t get your very far, I joined the iMake sock yarn swapping group on Ravelry to start swapping. Today I was very excited to receive my first parcel of wonderfully coloured yarns from Annelena from the United States. Thank you Annelena so much! I love the colours and your timing was just perfect as I can now spend lots of time this weekend knitting my blanket with great new colours. Although it’s not a difficult project, I ended up making a mistake with the second square (the pink and purple one) I knitted and the diagonal line through the square ended up 90 degrees from where it should have been. I’d like all my squares to be in the same direction, but I think I will leave this square as it is, just as a reminder of the learning process. I do have a tendency to be perfectionist, so this is a great opportunity to learn to tolerate imperfection! 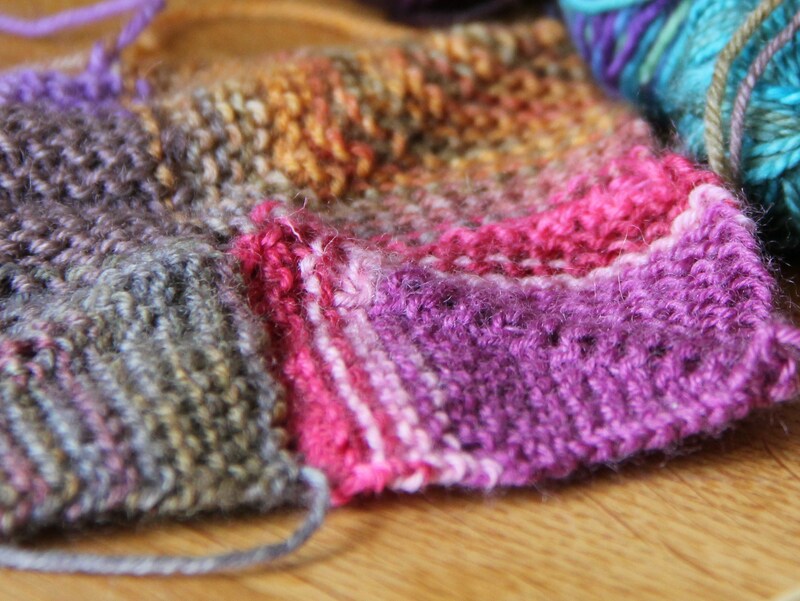 Categories: Knitting | Tags: blanket, knitting, sock yarn | Permalink. Yes I’ll post it on Ravelry. I love the blanket..very inspiring. Thank you..and feel better.